The vintage six shooter pendant was a quirky eBay find - the small silver pistol actually comes out of its highly detailed gold holster. 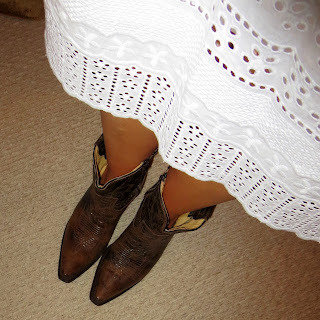 I've had at least one pair of cowboy boots for as long as I can remember. The best ones maintain the smell of handworked leather, bringing back memories of my Aunt Linda's tack room and countless afternoons riding local trails. This pair from Roper has that glorious tack room smell, and the scent of cherished memories envelops me every time I open their box. 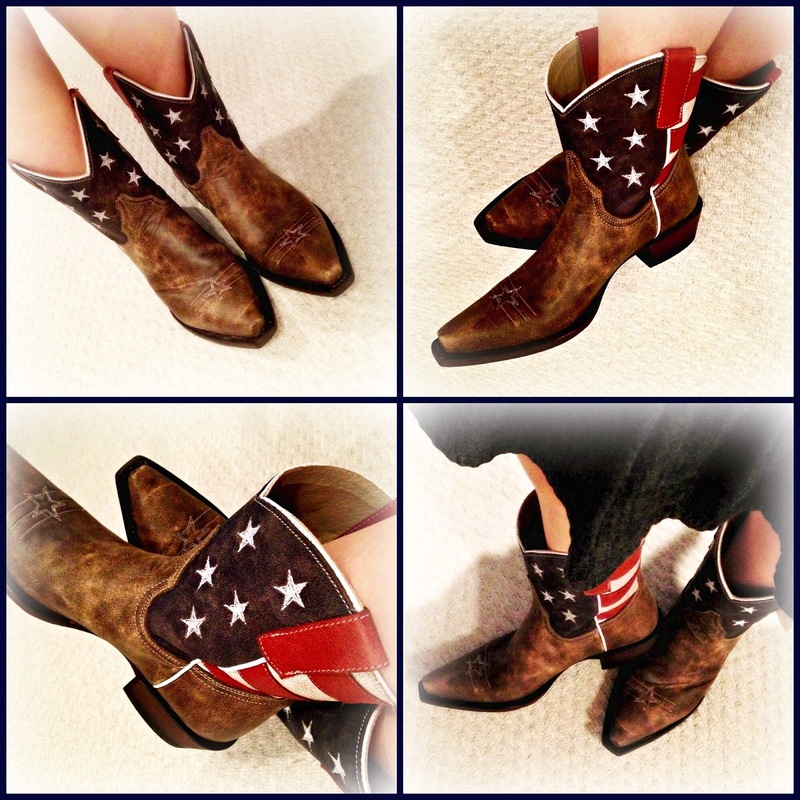 Though I don't get to ride anymore, the upcoming July 4th holiday gave me the perfect excuse to wear them, even if cowboy boots are somewhat of an anomaly at the office (to say the least). 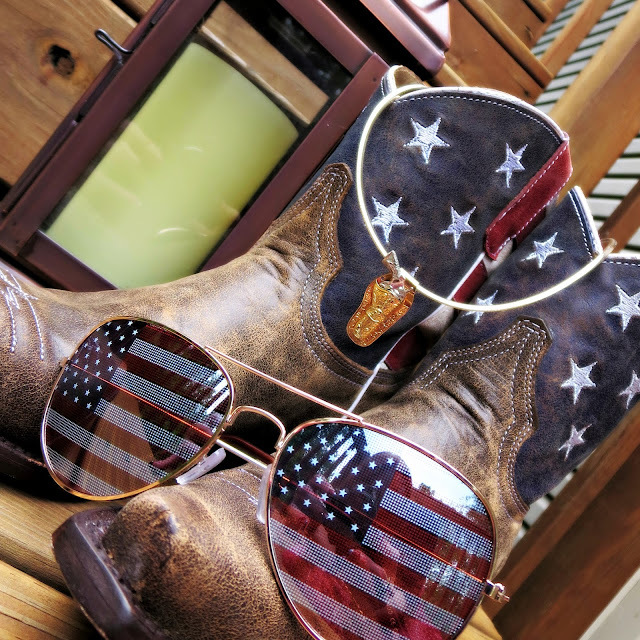 Western boots aren't for everyone, but those of us who love them REALLY love them, and it probably won't surprise you to learn that this is not my only pair. I am, however, very particular, so my collection is small and well-curated. 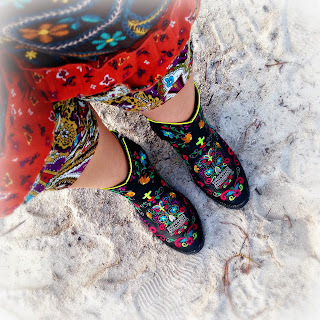 More so than any other style of shoe, I'll only buy boots when I have a visceral reaction to them, and even then only if they also fit perfectly (this is a good thing, since well-made boots can be pricey). The same is true for the art I collect. My tastes are very eclectic, and I won't even consider a purchase unless it's love at first sight. Though it's quite different from most of the other original artwork I've accumulated over the years, one of my favorite pieces is a very large charcoal drawing of a Wyoming cowboy, or rather, the torso of a Wyoming Cowboy (I have lovingly dubbed it "The Cowboy Crotch"). This piece, more than any other, exemplifies my approach to art collecting (as well as boot collecting) - my reaction must be immediate and powerful. Art captivates me on an instinctive level (and regardless of whether it matches the sofa). I never dreamed that casually thumbing through this Victorian looking magazine at the grocery store would result in the purchase of a huge charcoal drawing of a cowboy from an artist several states away. I still have the magazine with my handwritten notes from my call to the artist in the margin. The Cowboy Crotch spoke to me when I least expected it, and in a most unusual way. I was standing in the checkout line of a local grocery when the Winter 2001 issue of Southern Lady magazine caught my eye. 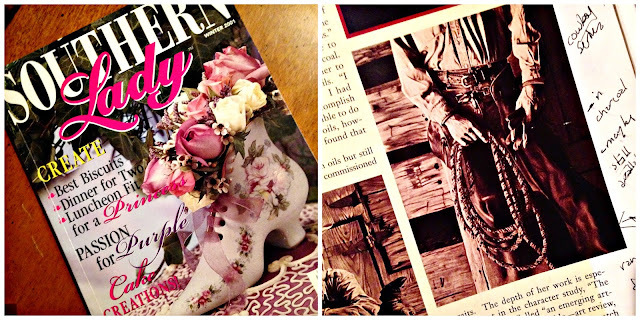 The cover photo featured a delicate Victorian ceramic shoe filled with fresh flowers. It grabbed my attention because, at the time, I was designing shoe-themed centerpieces for a fundraiser. It's impossible to capture the depth and detail of the piece in a photograph. The detail is so fine that the framer actually thought the piece itself was a photograph. As I thumbed through the very prim and proper periodical, though, I stumbled on an article about Farrar Hood, a young artist from Tennessee making a name for herself around the country. 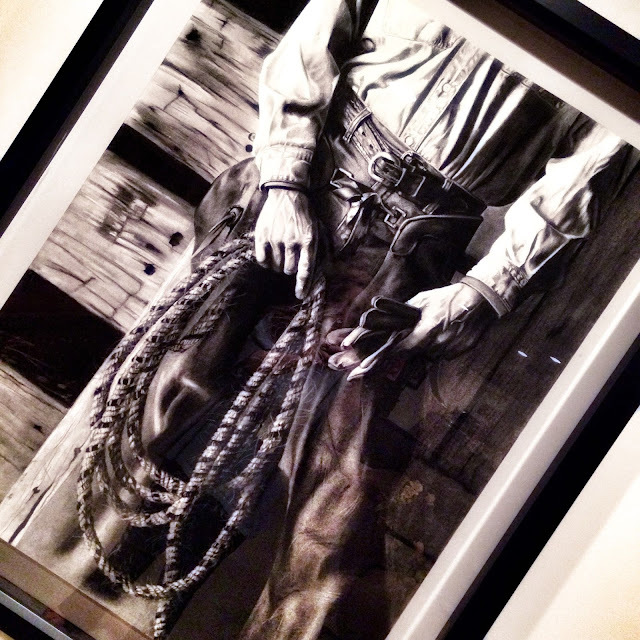 The article featured photographs of a series of cowboy and Western themed works she'd recently completed during a trip to Wyoming. I was so immediately enamored with The Cowboy Crotch that I brought the magazine home and immediately called the contact number included at the end of the article. 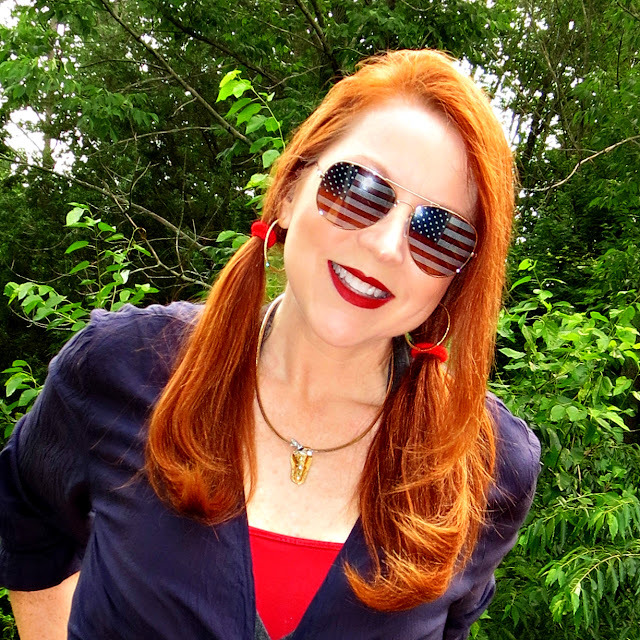 I couldn't resist a kitschy pair of $10 aviators from Steinmart for the July 4th holiday. Two weeks later an enormous wood crate protecting the 3 foot by 4 foot, unframed charcoal was delivered to my office. The magazine photo did not do it justice, just as the photo above does not do it justice. I have never regretted that snap decision purchase for a second, just as I have never regretted buying these boots. Also like my boots, The Cowboy Crotch is not for everyone, but for me, it's everything. 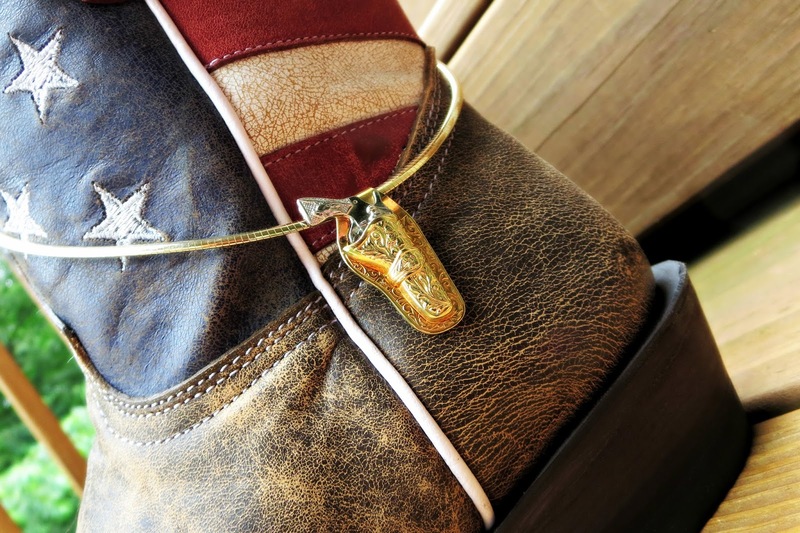 Collect only what you truly love, whether it's clothes, corvettes,or cognac - it's the cowboy way!